It’s never too early to get started with your Christmas shopping (yes, I know today is only Halloween)… and I really hope you’re OK with me talking about Christmas already! (Sorry Not Sorry) Tomorrow is November so I find it perfectly acceptable. Now, who could use some extra cash for the upcoming holiday season? The answer is “everyone”, of course. 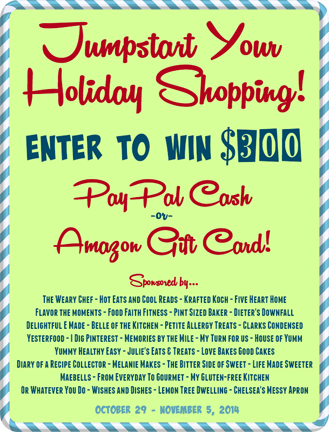 Therefore, I have collaborated with a great group of blogger friends who have all pitched in to give one of you lucky peeps $300 in Paypal cash OR Amazon bucks to help you get off on the right foot this holiday season. You can make your choice between the two prizes if you are the winner. Good luck! Entry is simple: you just need to use the widget below. The more pages you like, the better your chances are and you have until November 5th to enter. Easy does it. Oh, and Happy Halloween! I am fulfilling a life-long dream and going as Alice in Wonderland. I’m a Disney girl all the way 🙂 Be safe and have a great weekend. that’s pretty kind of you my friend!!! !